Well, if I made the Goombas and Koopas retro styled, they would look like that in every single level, so I'd rather not do that right away, but I might reconsider it later on. Why doesn't the patch work? Which must the ROM of base be? I have tried with EUR and USA ROM. However that Backgrounds has fascinated a lot me. The patch didn't seem to work for me either, even though it worked when I initially tested it, but if it was working, it would be for a USA rom. Have you retried to repatch the ROM with a ROM USA completely cleaning up? Even it works. I have wants to try this hack! I plan on making a new patch, which will be v0.15, after I at least finish World 2-Tower, which might take a couple of weeks if I'm still working on it. 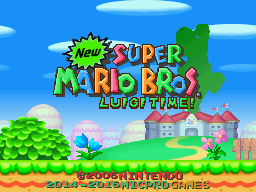 Well, here is World 2-4 in NSMBLT, I don't have much to say about it, other than that there are a couple of secrets. Here is a music hack that I made last night, and I have to say, it turned out pretty great in my opinion. This is not the last you'll hear of this hack, however, I just want to work more on my other hacks for a while. Also, new HUD layout. i think it is not the Chinese or Japanese version... somebody know the problem? The patch is for the US version, but when I initially tested it, it worked perfectly fine, and after hearing that the patch wasn't working a few months ago, I decided that once I get my computer back in June, I would try fixing it, so that there will hopefully be less problems. Thanks bro , but it still creates errors. i don't think it is your mistake,i think there is something wrong with my xdeltaui or rom.... but still thank you . Although, as is clearly obvious from the screenshot, a few changes had to be made to accommodate the new subnohara tileset, and that there is obvious cutoff in the far background(Blue Clouds), since I've yet to figure out how to add the correct background that is used in the main rom. 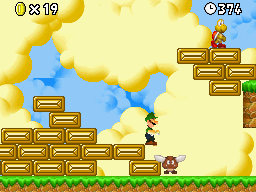 Among other things, such as changing the Blockhoppers to match the jyotyu blocks of NSMBLT, and modifying the score graphics to use the score graphics from SMA SMB2(aside from the 1up graphic, which is a green version of the one used in SMA4 SMB3), and porting the sdat from NSMBLT. But yeah, the only reason for me posting about this is to assure other users that the hack is not yet dead. Patches don't just 'stop' working.